Does the Information Counter provide support in foreign languages? 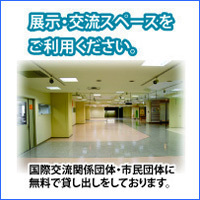 I want to link to the Asahikawa International Center homepage. Do I need permission? I want to learn a foreign language. What kinds of courses do you have? I want to hold an exhibition at the center. Can I borrow a location or facility? I want to distribute leaflets at the Asahikawa International Center. I would like to use the common meeting rooms. Do you have books where I can learn about foreign countries? I want to become friends with Japanese people. I want to do a homestay. I want to get a visa. Please tell me about Asahikawa sightseeing spots and events.